A cantilever of rectangular cross‑section has a mass at its end. Furthermore, it is loaded by an axial force. Calculate the natural frequency of the structure. Neglect the self‑weight of the cantilever and consider the influence of axial force for the stiffness modification. Member with the given boundary conditions is loaded with the moment and the axial force. Neglecting it's self-weight, determine beam's maximum torsional deformation as well as its inner torsional moment defined as a sum of a primary torsional moment and torsional moment caused by the normal force. Provide a comparison of those values while assuming or neglecting the influence of the normal force. A thin-walled cantilever of QRO-profile is fully fixed on the left end, and the warping is enabled. The cantilever is subjected to a torque. A cantilever is loaded by a transversal and an axial force on the right end and it is fully fixed on the left end. The problem is described by the following set of parameters. The problem is solved by means of the geometrically linear analysis, second order analysis and large deformation analysis. A structure made of I-profile is fully fixed on the left end and embedded into the sliding support on the right end. The structure consists of two segments. Beam pinned at the both ends is loaded with the concentrated force at the middle. 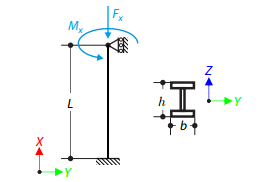 Neglecting its self-weight and shear stiffness, determine beam's maximum deflection, normal force and moment at the mid-span assuming the second and the third order theory. A beam is fully fixed (warping is restraint) on the left end and supported by the fork support (warping is enabled) on the right end. The beam is subjected to a torque, longitudinal force and transverse force. A steel beam with a square cross-section is loaded with an axial force and a distributed loading. Calculation of the maximum bending deflection and the critical load factor according second order analysis.